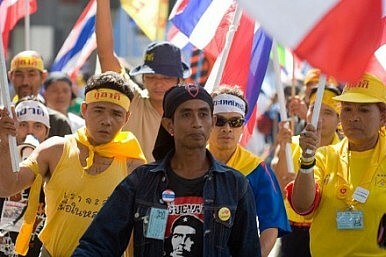 The Thai military has declared martial law, deployed in the streets of Bangkok and seized media outlets. The Thai military declared martial law at 3 a.m. on Tuesday, even as it denied it was orchestrating a coup. According to numerous press reports, the Thai military declared martial law on Tuesday in what it said was an attempt to restore law and order after six months of protests in the severely divided Southeast Asian nation. The army has been deployed throughout the capital city of Bangkok and it has reportedly seized some media outlets and forbidden the rest from reporting on anything that would jeopardize national security. The caretaker government is reportedly still in charge of running the country. The military has periodically threatened to intervene in the ongoing political crisis that pits the primarily rural supporters of ousted Prime Minister Thaksin Shinawatra against establishment types loyal to the monarchy. Most notably, Army Chief Prayuth threatened to use “full force” last week after an attack against an anti-government activist site killed three people and injured 22 others. Around 30 people have been killed in the political unrest since last November. The military is seen as leaning towards the anti-government, establishment camp although it has tried to maintain neutral throughout the current crisis. In particular, it has repeatedly tried to play down fears that intends to mount a coup against the political establishment. Thailand has seen some 19 coups (some say 11) since the end of absolute monarchy in 1932. The most recent one, which was in 2006, removed Thaksin Shinawatra from power. He now lives in self-exile. His sister, Yingluck Shinawatra, served as prime minister in his absence before being removed, along with nine members of her Cabinet, by the Constitutional Court earlier this month for allegedly abusing power. The rest of her cabinet was allowed to stay on and a caretaker government and prime minister was appointed with the task of organizing new elections scheduled for July 20. Those remain very much in doubt. Surprisingly, the caretaker government has come out in favor of the military’s declaration of martial law. “The government doesn’t have a problem with this and can govern the country as normal,” caretaker Justice Minister Chaikasem Nitisiri told Reuters. Reuters also quoted some of the pro-Thaksin activist supporters in the streets responding favorably to the army’s announcement. This is probably due to a belief that restoring law and order will allow elections to be held as scheduled. The declaration of martial law is likely to do little to alleviate the broader political crisis. As always, the royalist camp opposes elections because they know the pro-Thaksin forces will garner a sizeable majority. There are thus few viable options for moving forward that will appease or mollify the opposing sides.